Coffee machines, beans and everything in-between. 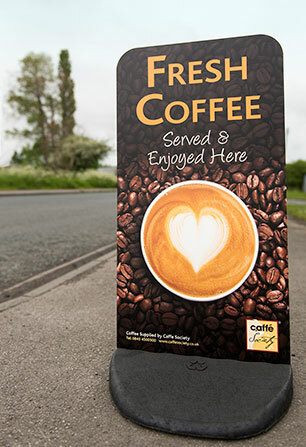 Caffe Society is a family run business with plenty of experience in the commercial sector, supplying coffee machines, fresh coffee, and other coffee shop essentials to a wide variety of sites, ranging from small corner cafes right through to coffee chains, restaurants and guesthouses. Based in Sherburn in Elmet, near to Leeds, we have fantastic access to the A1, M1, and M62. But importantly we love coffee, and if you're reading this then there's a strong chance you share our passion. Whether you are a nationwide contract caterer or an independent coffee shop owner you can be sure that Caffe Society is the perfect partner for you and your business. Able to supply a wide range of equipment, ingredients, and accessories, our focus is on providing unmatched and unrivalled customer service whilst offering both value for money alongside a comprehensive after-sales service, that guarantees peace of mind. In addition to selling coffee machines and ingredients, we can also provide a huge range of specialist beverage equipment such as juicers, blenders, and hot chocolate machines; all the items you will need to stand out from the crowd. In order to produce our distinctive range of Caffe Society Coffee, we source all of our beans from some of the finest growing regions and plantation in the world. Each type of bean has been specifically chosen due to their inherent characteristics. Hand-picked, sorted and then delivered to our warehouse in Yorkshire, we carefully roast on a daily basis, packaged then immediately shipped, to ensure a freshness and quality like no other. The new millennium had just begun and three brothers were looking to expand their current business. With a wealth of knowledge of coffee and café equipment amassed from extensive experience within the beverage industry, the trio could see that the popularity of the 'coffee shop' was about to explode. With a strong customer base already secured the decision was made to transfer their expertise to the coffee industry. Initially starting out by supplying local businesses with premium bean to cup machines, the new business was growing at a rapid rate and a regional sales teams soon expanded into a national company that specialised not just in bean to cup, espresso and vending coffee machines, with fresh ingredients being made available. By 2005, following continuing growth and investment, we had relocated from our initial base in Wetherby to Sherburn-in-Elmet before, in 2013, we moved over the road after construction had finished on our own purpose-built premises which features over 1,600sq ft of showroom space, warehouse, and a state-of-the-art service and maintenance facility. Over the years we have struck up a number of working relationships with some of the finest Italian manufacturers of coffee machines such as Astoria, Nuova Simonelli, and Jura. Through our close partnership with these companies, we have a wide selection of their machines on hand that are used specifically for testing and demonstration purposes both on the road and in our showroom. These continued partnerships have allowed us to help companies test, implement and install a raft of new features to their coffee machines, highlight and bring customer-centric improvements to the fore, something which sets us apart from others within the market. For any further advice, or to speak to a member of our team regarding a query or question concerning Caffe Society, please call our office on 01977 687 580.